I spoke about this planter I made in a post a few weeks back. My husband received this tin from one of his vendors which was filled with things like chocolates, cookies and coffee and he decided to bring it home. He realized I could think of something to do with this piece and “I thought planter”! I painted it using ASCP and I wanted to take the time to show it now that it is filling in with large Coleus and Vinca vine. I think it is so pretty sitting on one of many concrete benches in our yard and various garden areas. Thank you. You are always so kind with your support. I am sure you have been busy since you got back I just want to make sure you got my post and pictures for guest posting. It’s lovely, Cynthia – a great example of upcylcing!! Would love for you to share it on our All Star Block Party blog hop. I did post on your party. I try to re-purpose as much as possible. If you look at my blog you will see how much furniture I have redone over the years. I am now following via email. I hope you check out clochesandlavender.com Thanks again. Good thinking! It makes a beautiful planter, and that bench looks like the perfect spot for it. Nice to know you stopped by! I love how it turned out. Thank you so much for visiting me. I hope you check clochesandlavender out. It makes a perfect planter. Great color choice. The planter is so pretty and perfectly planted with the coleus and vinca vine… and it’s a really nice size too. Thank you so much I am following you now via linky. I hope you will give clochesandlavender a try. Look around a bit. Inspired idea – it looks fantastic! So lovely your husband thought of you and had confidence you’d make something wonderful out of it! My hubby is one of a kind! Thank you very much. Hi, Cynthia! I love the colors in that coleus. Great repurposing job on the planter! Looks like that’s what it was made for! That is what I thought as soon as I saw it. What a beautiful tin and I would love it either way? Your plants are gorgeous and it is beautiful on the bench. Glad he brought it home! I am too. I love it! By the way I love your blog. I follow you. 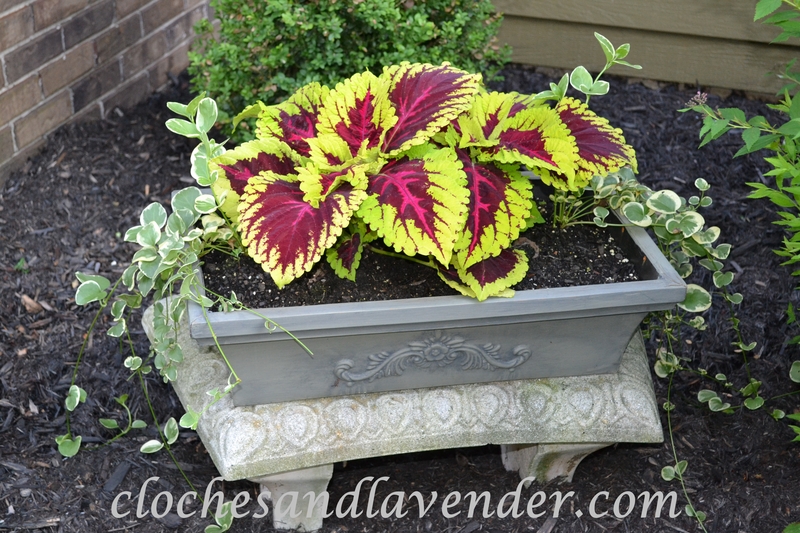 I love Coleus… your planter looks adorable…. Just lovely! Thanks for linking up to the All Star Block Party! Your piece on top of the French doors is fabulous! Absoluletely stunning too! You are soooo very talented. I also love the planter.Thank you for your lovely and sweet visit. Have a happy week. Beautiful! Thank you for joining me at Home Sweet Home!